Four of the members of SG-24 were already in the briefing room, scanning through their latest mission booklet when Lt. Kern came in. J stood up and went over to shake his hand. "Good to have you back, Lieutenant," he smiled, looking as if he really meant it. Which he did, more or less. Yes, it had been better with just the four of them - and Ash - but the lanky marine was definitely turning out very much better than his best hopes. The rest echoed J's welcome which brought a smile to Kern's face. "Well, thank you all kindly," he said. "It's good to be back!" He definitely meant it - couldn't imagine being welcomed like that by any other team. Bradfield, following closely behind Kern, was also pleased to see his reception. Major Mitchell had certainly justified the general's confidence in choosing him to set up and run a new team, regardless of the President's misgivings. SG-24 was shaping up to be a very successful team, despite the major's reluctance to have any marines as part of it. "All right, people, settle down. I'd just like to go over the salient features of this mission for next Thursday," Bradfield began, taking his seat. He gave the team an amused smile. "This a mission to another one of those Wildcard Worlds you like so much - P2Y-709. Much of the planet is covered by oceans and most of the land takes the form of clusters of islands. The 'Gate is on the principal island which is called Dar-gar-pa-hooee-hooee by the indigenous population. It's meaning is thought to be 'big island between two big seas.'" "That sounds Polynesian," Maxine observed. "I'm not very familiar with those languages. Each island has its own version There are a lot of them and they're all different." "I wouldn't worry too much about that," Bradfield continued. "The people are extremely primitive. Primarily they're hunter-gatherers. They make a living from the sea for the most part, augmented by a little agriculture. The principal reason for this mission is therefore not to set up a trading treaty for food. The early MALP footage shows seepages which suggests there may be oil deposits. So, Doctor Hunter, given that our oil supplies are close to running out, I'd like you to check on the viability of oil-mining there. If you find any other mineral deposits, that would be all to the good. Any questions?" There were none so the briefing was brought to a close. At first, they thought the 'Gate was in something like an old warehouse. On a primitive planet? The five drove their PATTs to the side of the 'Gate and parked up. A casual glance around revealed virtually nothing. The lighting was minimal. Flashlights helped but not a lot. The warehouse, if that was what it was, seemed an odd shape - not rectangular. Theo bent down and laid the flat of his hand on the floor - a metal floor. "I think we're on a ship," he said, sounding as if he didn't believe what he was saying. "The floor's vibrating - not much, but too much to be natural." The others checked and found that the walls were vibrating slightly also. There was otherwise no sign of life. "So what? We're on a derelict ship?" Maxine turned to J. "Accidentally on purpose?" "Normally, I say not - someone just made a mistake. But, with past experience, I'm not sure." "What's a Stargate doing on a ship anyway?" Kern wanted to know. "Good question, my friend," J replied. "Also, how do we get off the ship?" Kern asked. "I don't think that'll be a problem," Theo said thoughtfully. "We can rig up one of the PATTs' naquadah generators to power the 'Gate - or link a couple together if one isn't enough - then we can dial out manually." "So we're not trapped here?" Kern sounded relieved. "No, though I suggest we have a look around while we're here. We might find something useful," J decided, not sounding particularly hopeful. Theo, who'd been wandering around the 'Gate deck, gave a shout. "There's a computer consol back here, facing the 'Gate. It seems to be dead though." "Can you turn it on?" Luc asked. "Pity we don't have Ash with us," Luc said, "then he could fix the computer system." "Ah, no. I know exactly what he would say if he were here," Theo said and, mimicking his beloved geek, launched into an Ash-style tirade. "Knowing one computer system does not make you an expert on all computer systems. There are lots of them, and you have to learn about them all. Individually. And as for alien computer systems Just don't get me started! The idiots who wrote Wormhole X-Treme had Dr. Levant hacking into an alien system like all you had to do was plug it in, switch it on and type. It's just not like that in the real world!" "Well, the computer can't be totally dead," Luc observed, "since you seem to have found their sound system." "Great! Okay, you can turn it off now," J ordered. "That's not actually an improvement, Theo," J said drily. "I said, turn it off." "Sorry, but I think we're stuck with it." "Maybe the place is deserted because the 'music' drove them insane?" Kern suggested with a slight grin. J suddenly realized that Kern had just cracked a joke and bit back a sarcastic retort. Instead, he laughed and said, "You could well be right there, Lieutenant!" "Any one else notice that all the lyrics are in English?" Maxine asked. "Good point," J said. "Any thoughts about why?" "Maybe the original owners bought the sound system at the Agora?" Theo suggested. "Or maybe the whole ship was bought from the Agora?" Luc speculated. "If they had the money to buy this ship at the Agora - which probably wouldn't come cheap, why would they just abandon it?" J asked. No one had an answer for that so J decided to explore the ship from stem to stern. The 'Gate seemed to be at the forward end, and it occurred to J that the ship might not actually be abandoned. Her owners might return at any minute, in which case, it would probably be a good idea to keep Kern away from anything he might inadvertently talk about later. "Lucarelli, take Kern with you and begin exploring from the ship's stern. The rest of us will start hunting from here and hopefully, we'll meet somewhere in the middle." In the second cabin along, J and co. hit pay dirt. The small chamber contained shelves full of boxes and box files - an archive room perhaps? "I think you'd better check these out, Maxine," Theo said, flicking through the pages of a thick file. "I don't know what language it is, but it sure ain't English." Maxine looked over his shoulder. "Wow! It's Romanian!" She elbowed him out of the way, and turned over several pages, gasping now and again. "What is it?" both J and Theo asked. "I think it's a log book of body swaps. Some are marked with a capital A and some with a capital V. Now, I think the A stands for anticatod or target. When Dragomir tried to replace you, J, you weren't named but were referred to as 'the anticatod.' I've no idea what the V stands for though." As the other two went back to investigating the files and boxes, she continued to run her finger down the columns of names. "Ah, that looks useful; King, Tobias (A) - P9Z-596." "What? You've found him?" J asked as Maxine wrote the details in her notebook. "Um, why not just take the file back with us?" "Oh, just thinking ahead," she said. "Supposing the owners return while we're still here - and later on, they find a file missing?" "So what if they do?" "Well, Warren seems amazingly well informed about our activities sometimes..."
"Oh. So he might realize we make unscheduled and unreported trips on the side?" Maxine nodded, grinning. "Give the man a cig ohmygod!" "What?!" the other two exclaimed together. Maxine pointed at an entry near the bottom of the page she was scanning: Warren, Elijah (A) - P5Q-050. She was just adding that address to her notebook when they heard sounds of the 'Gate activating. J called Luc on his comm. "We seem to have incoming. Hold your positions and carry on investigating until you hear otherwise from me." J, 5mil in hand and followed by Theo and Maxine, made haste back to the control deck and hid behind the computer consol as several people arrived in an untidy heap on the ramp. 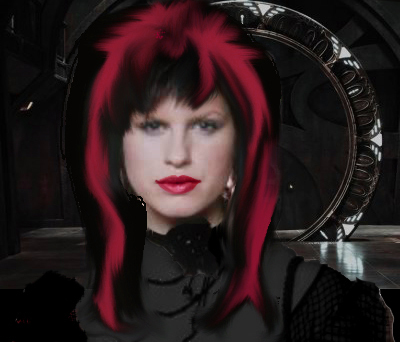 They looked to be in their teens and one was a girl with bright red streaks in her black hair. They didn't look too dangerous, so the team holstered their weapons. Maxine stepped forward, hand raised in peaceful greeting. "I am Doctor Pepperday. My friends and I are peaceful explorers and we arrived here by accident. Do you live on this ship?" The in-comers untangled themselves, and one, a tall, well-built lad with a shock of sandy hair, strode towards her. He didn't look too threatening, but J and Theo were taking no chances; they appeared from behind the consol. The youth slowed and stopped, looking very wary. "We live here on Dignity, yes. What business is it of yours?" "Well, we're not supposed to be here," Maxine explained, "so we were wondering where exactly we are and how to get to where we're supposed to be." "Did you come through the Fagaras 'Gate?" the youth asked suspiciously. "No, but I've heard of it. 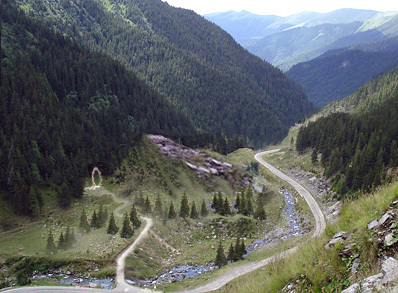 Some friends of ours threatened to send a bad man through the Fagaras 'Gate and he looked pretty scared by the threat." "So you're not... you're not Bruxai?" "No, we certainly are not," J said emphatically. "Are you?" The five teenagers looked mortally offended, exclaiming as one, "No way!!!" "Well, that's good," Theo said, "because the Bruxai tried to kill Major Mitchell here." "Then you must be good people," the youth said, relaxing a little. Another youth came forward. "Major Mitchell huh? Do you know my uncle Eneas?" "Leader of the Prasinos Team of the Contra-Bruxai?" Maxine asked. The second youth nodded vigorously, beaming. "It's okay, we're safe with them. My name is Gavril, by the way, though I'm usually just called Gav." "And you live here with your parents?" Maxine asked. "No, there's just us here," the girl said. The rest introduced themselves then. The first youth, who seemed to be their leader was Aurel. Stelian had thick black hair and a pale face which set off his intense blue eyes. Nandru looked tense and scared. "And then there's Marku," he said. "He's my little brother. He's - He's not here right now." "And what about you?" Maxine asked the girl. "That doesn't sound very Romanian," Theo commented. "No, it isn't. It's the title of one of my favorite songs. My real name is Reveka. We all like twentieth century music and we collect CDs when we go to the Agora." "Really?" Theo sounded interested. "My - er, my friend back home collects DVDs of films and television shows of about the same era." "So how come you're all alone on this ship?" J wanted to know. "Well, a couple of years ago at the Space Port outside the Agora, we kind of liberated it from the Bruxai," Gav said. "You mean you stole it?" J said, sounding stern. "Hey, we needed it more than they did. In fact, we needed it because of them." Aurel then took over. "We only stole one ship and we took this so we could escape. The Bruxai steal lives! Lots of lives!" "What do you mean?" Maxine asked gently. Aurel's face took on a stony look like a graven image. "My older brother, Virgiliu, was taken by them. When he came back two days later, he was an old man. Three months later, he died. He was nineteen..."
"That's terrible!" Maxine was truly shocked. "Yes, it is," Aurel scowled. "Any old man with enough money can 'buy' a young man and have his body swapped. The teenagers they take usually don't live more than a few weeks - months at best. So, as we knew about the Fagaras 'Gate and lived close to it, we hid out nearby then legged it through on the heels of the next party using the 'Gate. We found ourselves at the Agora." "That was kind of scary," Stelian said. "It's such a big place and we had no money and not much food. Then we saw the list of rules about not stealing and so on. We had no idea how we were going to survive, plus, if the vampirii saw us"
"Yes, that's what the men who 'collect' young people are called." Aurel took up the tale again. "Eventually, we found ourselves at the Space Port outside the Agora. The Dignity was just sitting there with her hatch open and all systems set - ready for a quick getaway, we thought. So we made a quick get away instead and ever since, we've been pursuing a gypsy life and opposing the Bruxan Empire wherever we could." Maxine looked at J. "I think vampirii, or something along those lines, could be what the V stands for in those log books." "Log books?" Gav asked sharply. "Yes," Maxine said. "There's a room full of boxes and files back there. Actually, I think the person best able to use those files is probably your uncle Eneas. He said it was difficult to track down people whom the body-swappers had sold as slaves. Those files might help." "Thanks, we'll check them out," Gav replied. "By the way," Theo put in, "how come you all speak such good English?" "It's mandatory in Romanian schools," Stelian said. "We were told the order comes from the man in the rabbit burrow across the ocean." Maxine gasped. "Warren!!! This is way worse than we thought. Sounds like he's controlling most of the world - the developed world anyway." "Which begs the question," Theo said, "who does he answers to...?" "Well, much as it would be nice getting to know you folks better," Aurel said, "right now, we have to get back to the Agora and rescue Marku - somehow." "Yes," Aurel said, sending a compassionate look at Nandru, "we were spotted by a couple of vampirii. They've been after us for a while now. Anyway, they pointed to Marku - he hurt his leg a few days back and can't run as well as the rest of us at the moment. The vampirii cried 'Thief,' and the Astunomia arrested him." "And you just left him?" J demanded angrily. "No! We didn't! You don't know how this works. We're going back for him, but we need money to try and buy him." "Oh, we know about the slave market," Maxine said. "If he's not fully fit, he shouldn't cost too much." "No, no, no, it doesn't work like that," Aurel stressed, "not with the vampirii. Marku is just the bait. They know we won't leave him - that we'll go back for him. Then, if they spot us, they'll do the same thing again." "And what's that?" Theo asked. "Point us out as thieves. Then, when the Astunomia arrive, they'll reach inside our clothes and produce a gold coin that they already had hidden in their hands. It doesn't matter how high the auction goes, they'll pay it, because the resale price to some sick old man will multiply the outlay ten, twenty, a hundred times over." "Well that's just evil!" Maxine exclaimed. "Yeah, so now, if you don't mind, we'll go change our clothes - and our appearances - and find something to sell to get some money. Maxine drew a sharp breath. "Wait a moment! I have an idea, but I just need to test it." She reached inside her jacket, and almost immediately after, commented, "Well that worked. Just need a longer test." She headed off the control deck, counting, "one and two and three and..."
In the blink of an eye, she was walking into the control deck, still counting, "Eight. One and two and..."
"What the hell are you up to?" J demanded. Maxine grinned and asked, "Where's your major's insignia?" J felt his shoulder and found only velcro. Puzzled, he told her to quit stalling. By way of reply, she took his hand and put his gold leaf on his palm. Then she said, "You'll need to give Luc his tramlines back too," and added his captain's insignia to J's. J still looked baffled as Theo cracked a grin of recognition. "Yes, but best not broadcast the fact, huh?" The three went into a quick huddle and Maxine outlined her idea. "Maxine, that's crazy!" J exclaimed. "You do realize, don't you, that if this doesn't work, you're going to be at the slave auction yourself - as one of the lots?!" "Look, I've tested it. Twice. I know it works and I know how much time I have. So long as you follow up when I call for help, we'll be fine." She beckoned Aurel. "I have a plan which should teach these vampirii a lesson by turning the tables on them. It's a little risky, but the risks will mostly be ours. We'll need you to come along, Aurel, likewise Gav and Stelian, to identify both Marku and the bad guys." "There were just two," Aurel said. "Ghenadie is the leader. He has the money - a large pouch of gold pieces at his belt. Dorin is his sidekick." "Good. I'm sorry but we'll be leaving you behind, Nandru," Maxine went on. "You have too much emotional investment in this. Ruby too, because you're too easily identified." "That's okay," Ruby smiled. "Ill look after Nandie. Just get Marku back. Please." J, Theo and Maxine naturally left their weapons behind. They knew the drill and didn't want to be stuck in a queue at the Oplostasio to recover their weapons if things went pear-shaped - as they very well might, J thought. Nor did they want to explain how they'd lost them if - when - got back to the S.G.C. The three lads had made a good job of changing their appearances. They were all wearing different clothing. Aurel had a baggy cap over his distinctive hair, as had Stelian who'd also darkened his pale skin. At the Agora, the teens were kept roughly in the middle of the group so they would be less conspicuous. They also stayed in their little family group. Without comm. units, J didn't want to be searching the Agora for them if they split up. So it was a long and tedious search for the two vampirii. It was worth the hassle when Aurel did spot them. They had their heads together, Ghenadie beside a high value goods stall selling jewelry and Dorin beside an adjacent fruit and vegetable stall. J and Theo positioned themselves some five feet behind the pair to give Maxine room to work. The three boys stood behind them. Maxine reached inside her jacket and began counting as she operated Grandfather Daniel's time loop brooch; she'd kept it pinned inside her jacket for safe-keeping ever since he'd given it to her. Around her, all movement ceased. First she plundered Ghenadie's money bag, putting several handfuls of gold coins into her inside pockets. Then she replaced the gold pieces with several glittery necklaces. Moving on, she put a couple of chunky gold rings into Dorin's money bag. Then she had an idea - there was still time... She took a juicy-looking apple and put it in Dorin's mouth - it was open as he'd been talking - and pressed his teeth into it. Finally, she put the apple in his hand and closed the time loop, yelling, "Help! Astunomia! - Klephtes! Klephtes! Klephtes!" Right on cue - a split second later it seemed to J and Theo - they launched themselves at the two startled vampirii. They wrestled them to the ground as several members of the Astunomia showed up. Maxine denounced Ghenadie and Dorin as thieves. "I just saw them take some necklaces and rings from the jeweler." The vampirii hotly denied any wrong-doing as the guys from the Astunomia jerked them, none too carefully, to their feet. "And the little guy stole an apple too." Dorin suddenly noticed the apple in his hand. Flummoxed as to how it had gotten there, he hastily dropped it, trying not to look guilty, and failing. "Why don't you search them," Theo suggested. Quick on the uptake, J pointed out the apple that Dorin had dropped. "See, it has the guy's teeth marks in the skin, and, oh look! He has crooked teeth that match the marks..."
Meanwhile, the Astunomia guys, assisted by a very helpful Maxine - who'd seen it all! - found the jewelry she'd planted on them. The two vampirii were promptly arrested and taken off to the slave market. The six rescuers also headed for the slave market. They only had to wait half an hour before Marku was paraded. Bidding for the skinny teenager was slow, and he was knocked down for fifteen silver units, a little less than Aurel had with him. The group went to exchange the money for Marku. Maxine asked Noah and Jethro how they were doing, but there was no time for conversation before they returned to the 'Gate. SG-24 still had their mission to complete. "Oh-oh," Aurel said, as the group set off up the path to the 'Gate. "I'm afraid so. See those three guys up ahead, dressed in black? They're vampirii. They work for Ghenadie."